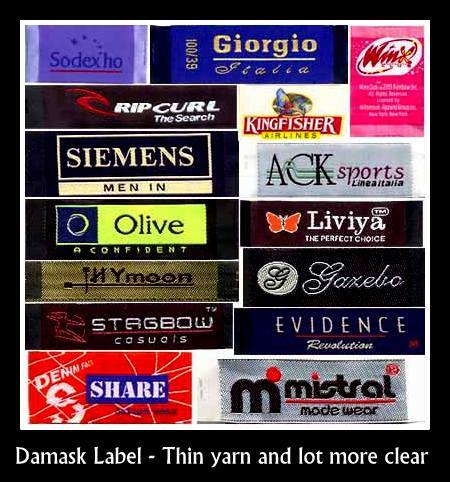 Woven and printed clothing labels in Chennai !! 2. 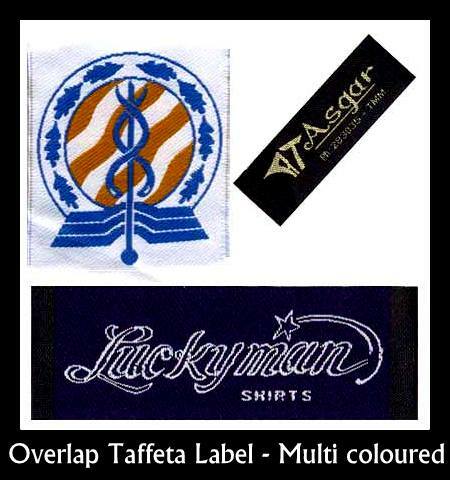 Overlap Taffeta label : The difference between Taffeta label and Overlap taffeta label is the usage of five to six colors in the weft. The exclusive quality of overlap taffeta label is that it can show more color tones, which is little difficult to acheive in other labels.The weft gets overlapped on the warp and five to six colors can be used on the plain warp of the label. 3. Damask Labels : Damask label has a high definition weave and is manufactured using at least two threads by making use of high speed looms. 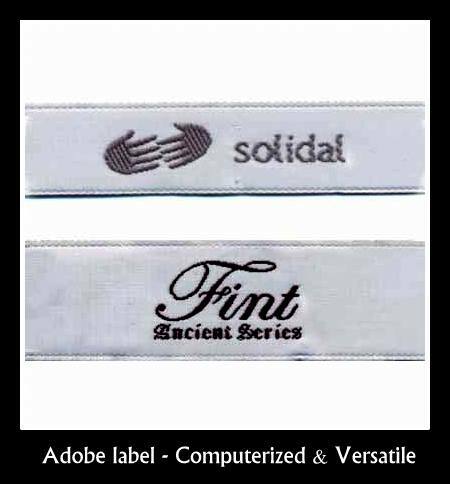 Instead of embroidery switch over to Damask label as the weaving technique will offer a good solid color and fine detailing and are much more cost-effective then embroidered items. To enhace brand image we suggest Damask labels. Made with higher density, it provides finer details and outstanding colors. Damask weaves are more expensive than Taffeta. 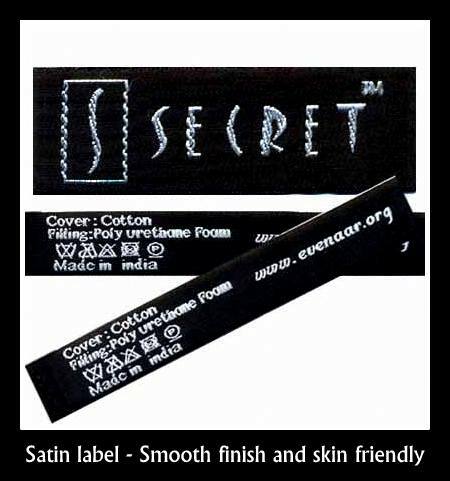 These labels are considered the high end among woven labels. We provide high quality labels made from damask, the high quality is achieved by high intensity, and thinner yarns. Clarity of detail and true logo interpretation is exceptional. Choose damask for detailed designs or texts. While the cost is higher, so is the superiority of the label for a fancy, pleasing appearance. 4. Satin labels : Our Satin woven labels are produced using automated high-speed single needle and broad looms with a superior quality outcome. Satin labels look very comfy and are extremely soft – at the same time, they give gleaming and fancy look. Because of its softness, it greatly reduces the chance of skin irritation. Satin labels have more sheen and are usually limited to basic ground colors. The quality of the label is thick double warp is used for up and one down. The material is sometimes referred to as slit satin referring to the slit knives that cut the labels to size. The labels can also be cut with hot knives. Satin provides a luxurious and shiny look with a soft feel. 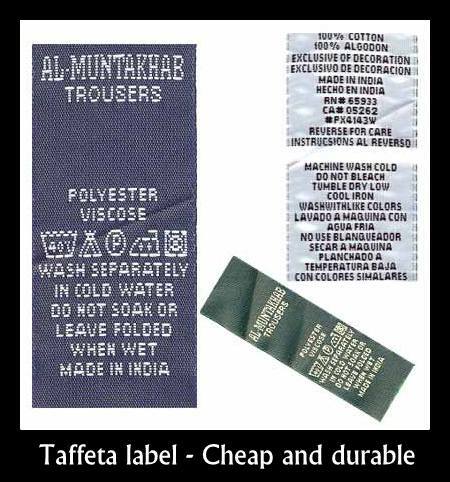 These labels are usually more expensive than Taffeta. 5. Adobe Quality : Adobe Quality is a new type of label designed by computer where pictures are used in higher quantity than normal taffeta and overlap taffeta label. Although the quality of Damask is higher than the adobe quality, but the quality and precision attracts the eye of many.